Easter will be here in a few short weeks and I wanted to share with how Jennie-O is making this Easter with recipes and meals easy to make and prepare. 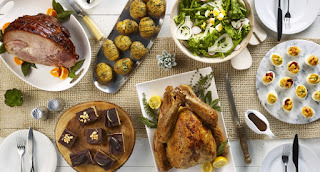 You can find them at http://www.jennieo.com/holidays-and-events/easter/menus and see what you would incorporate with this year’s dinner to spice it up and make something new instead of the same old. 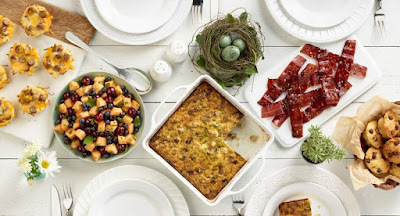 You can chose from Easter Brunch which includes Refreshing Fruit Salad, Candied Turkey Bacon, Banana Chocolate Chip Muffins (which you could add bits of Turkey Bacon on top). Easy Easter Dinner with Jennie-O Oven Roasted Turkey, Easy New Roast Potatoes, Crescent Rolls with Chives, Onion, and Cream Cheese. Gluten Free Easter which includes Sweet and Sassy Marmalade Glazed Turkey, Fresh Peas with Mint and Mint Chocolate Cheesecakes. Modern Easter with Creamy Spinach Soup, Honey Glazed Turkey, and Lemon Meringue Pie Shooters. The last menu is Delicious Easter Dinner with Easter Dinner Turkey, Peanut Butter and Chocolate Cheesecake Bars, Deviled Eggs with Bacon and BBQ.